Hustler Turf Equipment offers the new Mini Fastrak, which features 15/36 or 17/42 Kohler Courage and 16/36 or 16/42 Honda V-twin models. It is made with a welded frame and deck, as well as 18-inch drive tires and 11-inch caster tires. Maintenance-free hydrostatic transmission allows for true zero-degree turning radius. 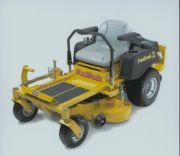 The units come with one of the best warranties in the business, with a full two-year bumper-to-bumper warranty on parts and labor, a lifetime warranty on the tractor frame and leading edge of the deck, and three years on the blade spindle bearings and front caster fork bearings. This year's summer Olympic tennis games will be played on blue DecoTurf tennis courts. DecoSystems, a division of California Products Corporation, is supplying all the cushioned DecoTurf playing surfaces for the matches. Both Deco Classic Royal Blue and Deco Classic Light Blue offer an attractive venue as well as superior visual ball-to-court contrast. DecoTurf can be fine-tuned to provide the precise speed of play desired. All DecoTurf courts have been classified by the International Tennis Federation in each of the three speed categories: slow, medium and fast. Lincoln celebrates its 50th anniversary serving the commercial swimming pool market. Lincoln's new 152-page catalog contains one of the most comprehensive selections of high-quality swimming pool equipment and aquatics supplies available. The catalog is organized into an easy-to-use format that helps you locate the products you need. United Receptacle has added recycling models to its Classics by Howard Product Line. The 25-gallon, perforated steel units are available in stainless steel, powder-coated black and custom colors, with powder-coated black steel tops. One model features a long, narrow opening for newspapers. Another has a 5-inch diameter opening for cans and bottles. Other features include black rigid plastic liners, leg levelers for stability on uneven surfaces and optional recycling decals. These models can be clustered with 25-gallon or 51-gallon capacity waste receptacles to create a convenient and attractive recycling center ideal for sports facilities, corporate centers, airports and shopping centers. BOLDR has created a system that teaches climbing step by step, section by section, in a safe manner. This is not a cookie-cutter playground component but rather a real-deal climbing wall. TrainR is a multicomponent curvilinear structure made of tough precast concrete. It's big, it's funky, it bends, it twists—and it teaches real climbing techniques. TrainR provides exercise while offering heart-thumping fun and building strength, balance and, perhaps most important, confidence. Spectrum Aquatics® offers Marias II, a new and improved commercial swimming pool energy-saving blanket system. The U.S. Department of Energy advocates the use of energy-saving blankets on commercial pools, while some states mandate their use. Blankets save thousands of dollars in energy and operating costs annually, with indoor pools surprisingly showing the greatest cost savings. Made with high-density polyethylene outer fabric layers, Marias blankets feature a 12-by-12 thread count per inch for superior strength and durability. The fabric is coated with an ultra violet ray-stabilizing agent, then flame laminated to a foam flotation core. Weighted wind-resistant edging is provided. ProBatter Sports, LLC has been granted a patent for technology for use on its ProBatter II line that converts a traditional pitching machine into a video simulator. The ProBatter system combines a state-of-the-art computer-controlled baseball pitching machine with cutting-edge video technology that permits a batter to enjoy batting practice with game-like conditions. The ProBatter Professional simulator can throw fastballs, curves, sliders, cutters, change-ups and screwballs on an interchangeable basis to multiple locations at speeds up to 100 mph, all with pinpoint accuracy. Images of both right-handed and left-handed pitchers are displayed on the screen in sync with the pitching machine. Humane's Guardian SuperSport and Loktuff® flooring is made from post-consumer recycled rubber and is re-vulcanized during the manufacturing process. Standard sizes for SuperSport mats are 4 inches by 6-3/8 inches, 1/2-inch and 3/4-inch thicknesses. Loktuff® interlocking flooring sizes are 3/8-inch, 1/2-inch and 3/4-inch and can be custom to cover any area. Both products are available in colors including midnight, coral, emerald, glacier (1/2-inch and 3/8-inch only) and black. Loose lay product works on any surface.